I am directing this post to all Christians who read this blog. If you are not a believer in Jehovah God, then I don't expect you to view His Word as holy and trustworthy. But if you proclaim yourself as a follower of Jesus Christ and His Father, the God of Israel, then I would like to ask you to be very sure of what His Word says. I am becoming increasingly alarmed at the Evangelical movement in the American Church and their growing anti-Israel stance. More and more "Bible colleges" and popular Evangelical preachers are boldly denouncing modern Israel's claim to the Holy Land. However, they are not doing so based on Biblical interpretation, but along political lines. These preachers and professors are undermining Biblical primacy and encouraging young believers to rebel against what they perceive as the excessive biblical literalism and political conservatism of their parents. The millennial generation comes to this ideological conflict with a desire to stand with the oppressed and downtrodden, (whether they are actively seeking to imitate Christ or following popular social ideals). Either way, they want to decide for themselves which party is being oppressed in the Arab-Israeli conflict. But if you call yourself a Christian, you cannot rightly do that without seeking out what God has to say on the matter. He should be your first go-to Source! 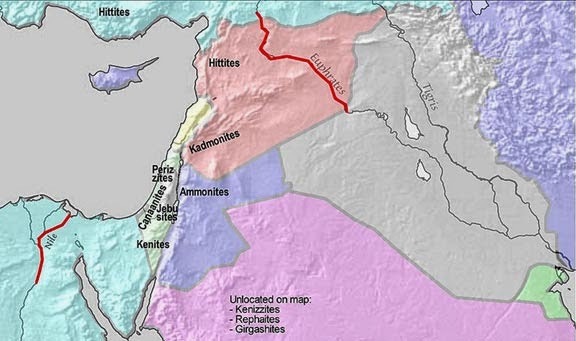 What God says here in Genesis, Chapter 15, He also repeats in Joshua 1:4: “Your territory will extend from the desert to Lebanon, and from the great river, the Euphrates—all the Hittite country—to the Great Sea on the west.” Whenever God repeats Himself, we would do well to pay extra attention. It is very clear that God gave to Israel the land which included everything from the Nile River in Egypt to Lebanon (south to north) and everything from the Mediterranean Sea to the Euphrates River (west to east). Yes, Scripture refers to long-ago names of these lands, but it is the same land, nonetheless! So what does that look like today? If Israel were to claim what God commanded they are to possess, it would be all of the land modern Israel currently possesses, plus all of the land of the Palestinians (the West Bank and Gaza), plus some of Egypt and Syria, plus all of Jordan, plus some of Saudi Arabia, Lebanon and Iraq. Israel currently possesses only a fraction of the land God has promised! If you are a true student of the Bible, then you know that Israel's numerous rebellions against the commands of their/our God resulted in temporary loss and restrictions from the Land. But the promise remains! That being said, I am not so rigid that I believe that every political decision by the modern leaders of Israel must be applauded; just as the decisions of ancient leaders were not always the will of God. It is His plan for a spiritual restoration of the Nation of Israel as they live in the physical lands He has promised them. As Christians, we must pray for God's will and purpose for this besieged nation of Israel. Politics and social agendas must not play into our discernment of this matter. No one should desire violence or war against either party in the ongoing conflict. But make no mistake, God will determine this outcome, and He has stated over and over in His Word -- both Old and New Testament -- that He will curse those who curse Israel, and bless those who bless His nation. Don't take my word for it ... take His!